As with most do-it-yourself projects, the first one usually takes the most time and can be a little frustrating. But by the time the last window is installed you finally feel like you “get it” and generally feel pretty good about the process. 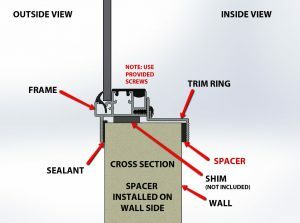 As you might suspect, there are many factors that combine to make every installation somewhat unique. Some of the variables include type of vehicle, model of window, size, window and hole radius issues, wall thickness, interior obstructions (window coverings, etc. 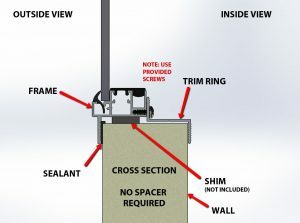 ), type of installation (interior clamp ring, rubber set, or exterior surface mount), window configuration, etc. 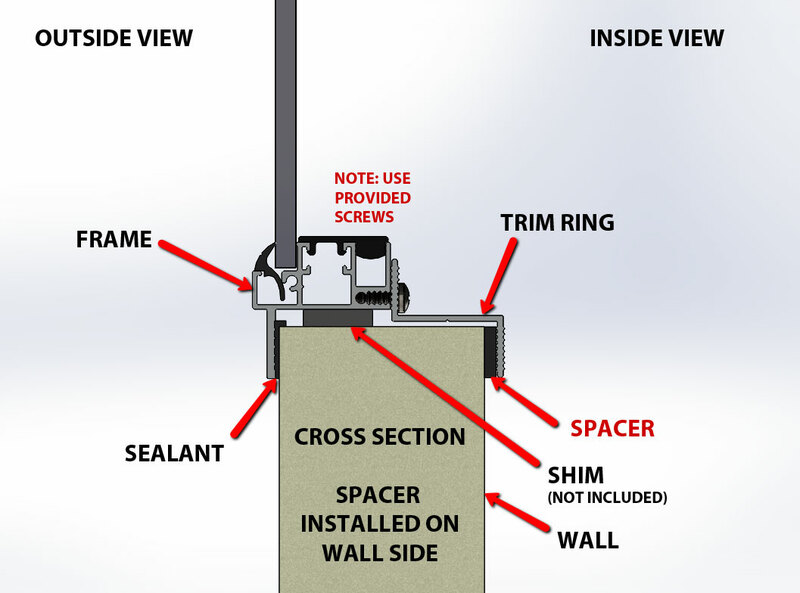 We hope the following description of a typical installation will provide useful information, tips, and pointers to help make your installation go as easy as possible. Most windows are shipped with interior trim rings, fasteners, and flange seal tape. 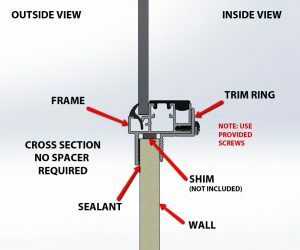 The portion of the window that fits into the wall opening must be smaller than the hole (1/8 inch clearance between window frame and the wall is typical). 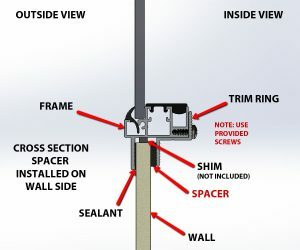 The thickness of the wall at the opening must be relatively consistent for the trim ring to clamp the window properly. The window needs to be centered in the hole by using shims between the window and the bottom of the opening. Step 1. Prepare the window opening. If you are installing a replacement window, you will obviously have to remove the existing window. 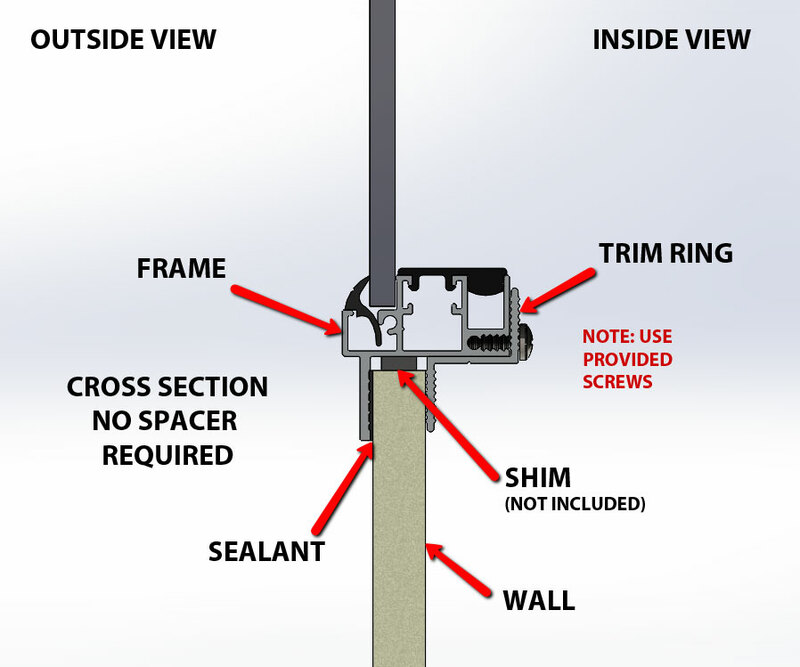 The most typical installation is a clamp-in style window. To remove the old window, first remove the screws on the trim ring on the inside of the vehicle. Once the screws are removed, the window is pushed out of the opening by applying force from the inside. It is often necessary to release the sealant from under the window flange on the outside of the vehicle. Often this can be accomplished by working around the outside flange of the vehicle with a very thin putty knife. Select a corner of the window, work the flange loose, and push the corner of the window out of the hole. Once the window is out of the hole, you will have to carefully remove any residual sealant that is stuck to the outside wall. Step 2. Dry fit the new window in the exposed opening.It is a good idea to try inserting the window in the opening to verify the fit. This process works best with 2 people working together. Make sure that the exterior window flange overlaps the opening sufficiently to make a good seal. Determine if shims will be required to center the window in the opening.Remove the window in preparation for the permanent installation. 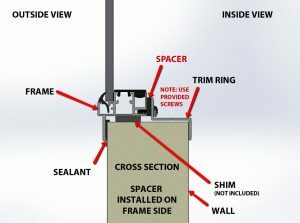 With the window lying face down on a soft surface, apply the seal tape on the flange starting at the middle of the bottom of the window and overlapping the 2 ends by approximately ½ inch. Pull the backing off of the tape. Use a spray water bottle and mist the perimeter of the opening on the outside of the vehicle. 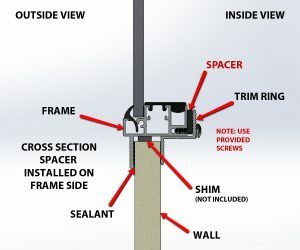 This is done to prevent the tape from sticking to the outside wall before you are satisfied with the final position of the window. It is often easier to handle a window if the sliding glass is in the open position. Remove the window screen during installation to prevent it from being damaged and to make it easier to handle the window. 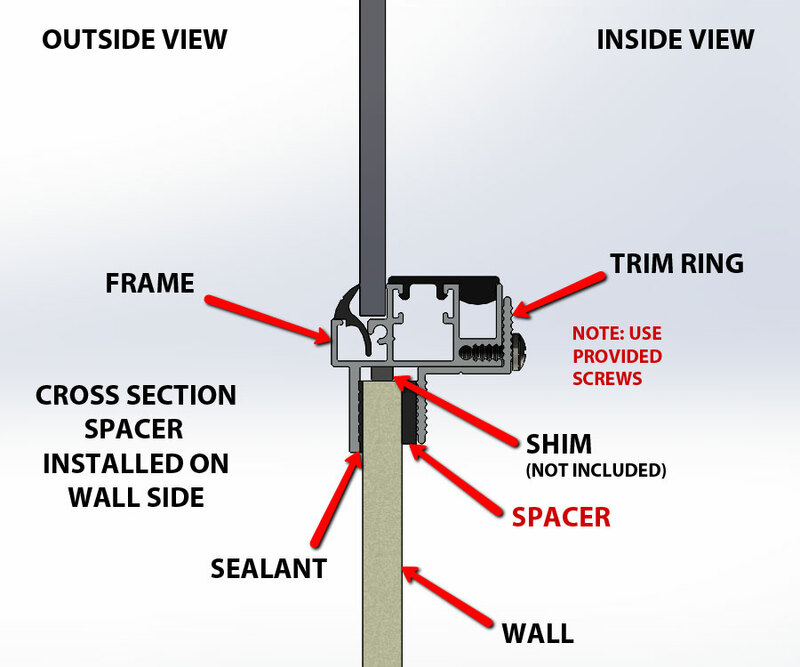 Make certain to use the screws provided with your windows for installation. 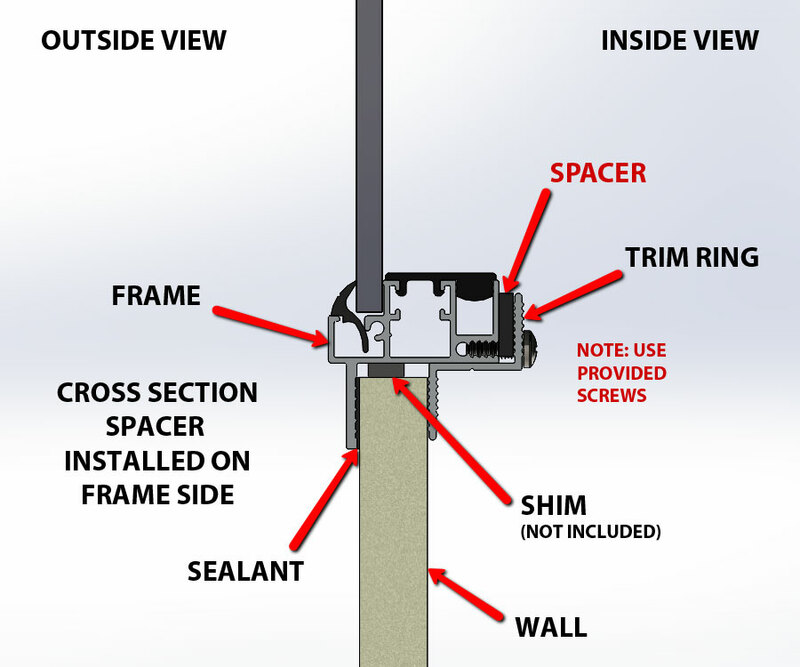 Use of longer screws can puncture the window frame and be a source for a potential leak. You are now ready to insert the window into the opening. This is normally a 2-person task. 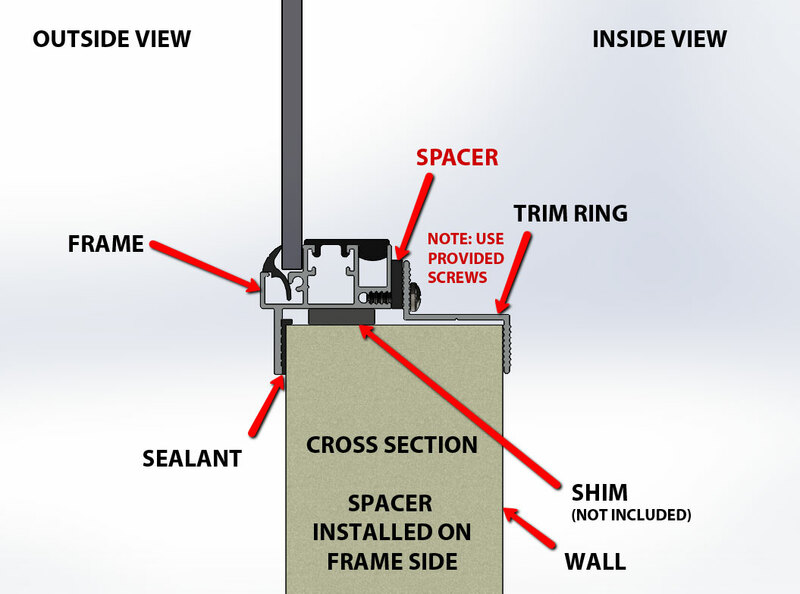 When you are satisfied with the final position of the window, have one person hold it in place while the second person centers the clamp ring on the inside of the window and installs the screws provided. Install the screen by inserting it into the screen track, pushing up and pivoting it into place. More on RV sliding windows.